If you are planning on hosting a spring cocktail party, these refreshing drinks are sure to be a hit. Try out these fresh, fruity, and delicious mixed drinks at your next social gathering to ensure that everyone has a great time. This refreshing cocktail is wine-based and includes a hint of gin for a crisp and desirable flavor. The experts suggest that this drink should be served inside of vintage style teacups to add a unique touch to your outdoor dinner table. Shake all ingredients along with ice and serve. This cool and delicious sweet drink is sure to be a refreshing change of pace on those warm spring nights. In a saucepan, heat 1 cup of tangerine juice and sugar over medium heat. Once sugar has dissolved, place the mixture in a bowl and add in the remaining tangerine juice and the sparkling wine. Chill in the fridge. Freeze the mixture in an ice cream machine. The Sorbet will be soft. Place it in the freezer until it becomes firm. Scoop the sorbet into wine glasses and pour sparkling wine over. Serve immediately. This beautiful floral-inspired cocktail looks almost too pretty to drink. Shake Elit, lemon juice, and simple syrup along with cracked ice. Strain into double rocks glass. Top with crushed ice and float Crème de Rose on top. Moscow Mules are drinks that have long been favorites at the bar. They are exceptional for warm weather and include sweet ingredients such as fresh blueberry or raspberry syrup. Raise your glass to this sunny day drink with a fruity twist. In a Collins glass along with ice, you can combine vodka, Chambord, and lime juice. Top off with ginger beer and garnish the drink with mint and lime. Stir gently and enjoy. This is a refreshing cocktail that is perfect for spring and perfect for drinking seaside. Combine the ingredients together over ice and garnish with pineapple chunks on a small skewer. This unique flavor combination is inspired by a weekend getaway to the spa or a stay in Ireland. It is light and refreshing with the right amount of sass added in. Muddle the cucumber slices together along with mint leaves, lime juice, sugar, and jalapeno. Combine the ingredients in a shaker along with vodka and ice. Shake well and strain into a chilled cocktail glass. This is a sophisticated drink that will work well at any type of spring dinner event. Combine all ingredients except for the beer. Shake and strain into a highball. Top off with beer and garnish with lemon. With a look as refreshing as a new spring day, this drink is sure to be a hit at your next cocktail party. Add honey, vodka, grapefruit juice and lemon juice to a cocktail shaker with ice. Shake for 10 seconds and place it to the side. Wet the rim of the glass with a citrus wedge. To coat the rim, place the glass upside down in a plate of sugar. Pour cocktail into the goblet and add ice. Accent it with a fresh flower. 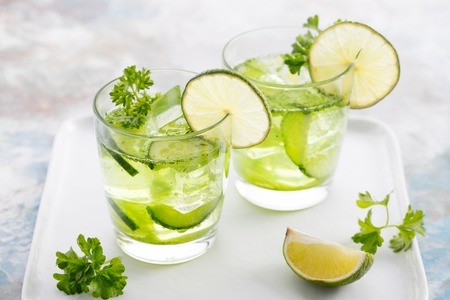 A Cocktail party is a great way to entertain guests and reconnect with friends that you haven’t seen in a while. These refreshing springtime cocktails will make the perfect addition to your evening dinner or cocktail party in the coming months.